The Left in India seems to be in complete disarray. It does not look as if it can reinvent itself and make significant contributions to natio-nal politics. At the heart of the problem is its ‘success’ in West Bengal, where it has ‘ruled’ for over three decades. The most distinctive thing about Left politics in India is the deep chasm between saying and doing. This happens at two levels. First is the disconnect between what it professes at the level of national politics and what it does in the states where it ‘governs’, mainly West Bengal. At the national level, it keeps regurgitating tired rhetoric about ‘anti-imperialism’. This leads it to take hardened stances on policies. Sometimes these are fair, sometimes merely doctrinaire and obstructive. This would not have been as big a problem if the Left’s position had always been principled. After it adopted a new industrial policy in the 90s, the Left government in West Bengal embarked on a programme of industrialization, unfortunately failed, that invited investments from within and without the country. The state does need industrial growth. But there was a mismatch with stated policies from the cpi (m) politburo and that being followed in the state. 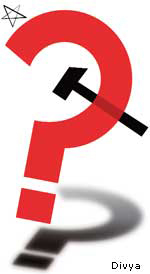 The fundamental problem with the Left Front government in West Bengal is one of governance. All its years in power, except arguably the first five-odd years, it has relied for its survival on the appeasement of special sectional interests, subversion of the opposition and capture of institutions of every conceivable description. It has created not just a political arena, but a society, dominated by the party and partisan. The result is: collapse of the educational and health systems, growing unemployment and a culture of political and civic violence. Not long back at a seminar it was suggested that all this was an outcome of what the cpi (m) professedly is: a Marxist-Leninist party that has always said the point of engaging in parliamentary politics was to further the cause of revolution. The point was made in a somewhat facetious vein. But the observation draws attention to the second basic problem with the Left. When it joined the parliamentary mainstream, it beca-me in effect a social democratic party. But it continued to recycle revolutionary rhetoric—as if that absolved it from the responsibility of putting together a Left agenda of governance. The cpi (m) has lost a historic opportunity to affirm the importance of a genuine welfare agenda. The Left had small but significant pockets of support all over the country. Most of them have gone, hijacked—or demolished—by one or the other political force. Instead of establishing a welfare agenda in the states under its rule, the Left seemed to allow the party to demobilize. Once the party discovered the formula for staying in power in Bengal and Tripura, and kn-owing that Kerala would vote it in alternate elections, the hard work of mobilization based on a credible programme became unappetizing. The unlikelihood of getting elected elsewhere was perhaps another disincentive. Hammering out a left-of-centre, welfare agenda would involve looking at the West Bengal experiment. The Left consolidated when it implemented a land reform programme there. It did not drive it to a logical conclusion—unless the takeover of the party and the countryside by new kulaks and contractors is logical conclusion. Power was maintained by the pervasive presence of the party and its control over virtually all aspects of rural life, mainly through panchayats—its much-trumpeted achievement. The discontent was there—it needed a matchstick. That came in the shape of the government’s autocratic, forcible land acquisition programme for industry—even as it castigated the Centre for its policy on special economic zone. If there had been a more thought-through development agenda administered with less dislocation and if there had been safety nets, the cpi (m)’s industrialization policy might have had the ghost of a chance. But the ham-handed attempt to deprive people of fertile land, often their main if not only source of livelihood, and for inadequate compensation, was a recipe for disaster.